David Broder (A.B.,’47, A.M.,’51) has won the University’s distinguished Alumni Medal. He will give the Alumni Convocation address Saturday, June 4. The 2005 Alumni Awards will be presented at Alumni Convocation at 10:30 a.m. Saturday, June 4, in Rockefeller Memorial Chapel. Political journalist David Broder (A.B.,’47, A.M.,’51), winner of the 2005 Alumni Medal, will give the convocation address. Other members of the alumni community who will be honored for their service to the University and to the communities in which they live and work are featured below. Created in 1941, the Alumni Medal is awarded to recognize achievement of an exceptional nature in any field, vocational or voluntary, covering an entire career. It is the highest honor the Alumni Association can bestow. Because the value of the medal is defined by its recipients, it has been given sparingly. The medal is awarded to no more than one person each year and need not be awarded on an annual basis. David Broder (A.B.,’47, A.M.,’51) is the national political correspondent for The Washington Post whose twice-weekly column on American political life is syndicated in more than 300 newspapers around the world. Additionally, millions of television viewers watch Broder’s regular appearances on NBC’s Meet the Press and CNN’s Inside Politics. Among numerous awards, his work earned the 1973 Pulitzer Prize in Journalism for distinguished commentary, and in the years since, he has continued to be acclaimed for his integrity, factual accuracy and insight. Before joining The Washington Post in 1966, Broder covered national politics for The New York Times, The Washington Star and Congressional Quarterly. He has reported on every national campaign and convention since 1960, traveling up to 100,000 miles each election year to interview voters and report on the candidates. Broder has mentored young journalists, many of them fellow Chicago graduates. Recently he formalized this teaching role as a professor of political reporting at the University of Maryland. He is the author of seven acclaimed books, among them Behind the Front Page: A Candid Look at How News Is Made (1981), The System: The American Way of Politics at the Breaking Point (1996), and most recently, Democracy Derailed: Initiative Campaigns and the Power of Money (2000). The Alumni Service Medal was established in 1983 to honor a lifetime of achievement in service to the University. Since his graduation from the Law School more than 60 years ago, Maurice Fulton (A.B.,’40, J.D.,’42) has demonstrated an unwavering devotion to the University through his volunteer positions and wide-ranging philanthropic commitments. Fulton’s involvement began as an undergraduate in the College, where he met his future wife, Muriel Fantus Fulton. He then entered the Law School, where he was an editor of the University of Chicago Law Review. After service in the U.S. Navy, Fulton joined the Fantus Company, the world’s oldest consulting firm devoted exclusively to industrial location and economic development. As principal, president and then chairman of the board for 35 years, he consulted on more than 6,000 location decisions for industries producing everything from semiconductors to automobiles. Fulton has published many books and articles, and he has lectured extensively on economic development and industrial location. He has taught at the Graduate School of Business and in the Department of Geography. Fulton also has served as consultant to two U.S. presidents and the governors of 11 states. Fulton has been particularly devoted to the Law School, where, in 1988, he established and endowed the annual Maurice and Muriel Fulton Lecture in Law and History, and underwrote construction of the Maurice and Muriel Fulton Room in the D’Angelo Law Library. A dedicated supporter of that library and others on campus, Fulton endowed periodicals, and book collections in geography and cartography, and law and economics, which together add more than 200 new titles each year. The Young Alumni Service Citations—awarded for the first time during the 1992 University Centennial—acknowledge outstanding volunteer service to the University by individuals aged 35 and younger. Kathleen Abbott (A.B.,’95) provided energetic alumni leadership. A three-sport varsity athlete, she continues to support women’s athletics and helped plan the Graduate Women’s Athletic Association 100th anniversary celebration in 2004. As young alumni program chair for the San Francisco alumni club, Abbott has shown creative verve in planning and executing events to attract a large and diverse audience. As program chair for the College Class of 1995’s fifth reunion, she helped add special events to the weekend festivities. She also will co-chair this year’s 10th reunion program committee. She also has served her class as its correspondent since 1998, submitting alumni news for nearly every issue of the University of Chicago Magazine. Eboni Howard (A.B.,’92) began her service to Chicago athletics as an undergraduate, when she served as captain of the women’s basketball team and president of the Women’s Athletic Association. After graduation, she coached the University’s women’s team. Since 1996, Howard has co-chaired the Graduate Women’s Athletic Association, which supports the University’s current and alumni female athletes. In leading the organization, she has encouraged older alumni and recent graduates to mentor younger members. She was instrumental in guiding GWAA’s successful development effort for the Ratner Athletics Center and helped plan the group’s 100th anniversary celebration. A member of the guidelines committee for the University’s Athletics Hall of Fame, she helped select the inaugural class of athletes, inducted in 2003. Howard also encourages minority women to participate in athletics and trains them for triathlons. A Senior Researcher for the Chapin Hall Center for Children, Howard explores the influence of social programs, poverty, ethnicity and governmental support on the well-being of families and children. Greg Miarecki (A.B.,’94, J.D.,’97), who served as student government finance chair and was an active member of the Delta Kappa Epsilon fraternity, has helped revive significant campus traditions, including the annual inter-fraternity council sing competition. The oldest such competition in the country, Chicago’s IF Sing began in the 1920s and drew hundreds of Greek alumni back to campus each spring. Concerned by dwindling support for the competition, in the late 1990s, Miarecki forged a coalition of alumni, fraternity leaders and University administrators to revive the IF Sing tradition. His leadership has helped to return the IF Sing to Hutchinson Courtyard, and it is once again a marquee event during Alumni Weekend. Its success has helped draw more Greek alumni back to campus and has increased interaction between alumni, students and faculty. Miarecki has worked with current students to promote Greek life at Chicago and to ensure the vitality of his own fraternity, encouraging leadership and service to the University. Created in 1988, the Alumni Service Citations are awarded for outstanding volunteer work on behalf of the University through service in alumni programs, on advisory committees and through efforts made to ensure the welfare of the institution. Deanna Bennett (A.B.,’67) uses her creative intelligence, enthusiasm and organizational skills on behalf of the alumni community. As president of the Tampa Bay Alumni Club, she has revitalized the group’s activities, spearheading well-attended public forums focusing on current events, academic trends and social issues. On behalf of the College Admissions office, Bennett has helped recruit prospective students with the club’s popular book award for outstanding high school students. She interviews applicants and has held summer send-off parties for new and returning students and their families. Bennett also has been the key communicator for the College Class of 1967, serving as class correspondent and providing alumni news for the University of Chicago Magazine. Bennett is currently writing a mystery novel, acting with her husband in their improvisational theater company, and running the writers’ program at her local library. Douglas Jackman (A.B.,’89, M.B.A.,’95) began his volunteer service to the University even before his graduation from the College. His leadership was recognized at graduation with the Howell Murray Award. As a young alumnus working in New York, he was active in the New York Alumni Club, helping to organize the New York Centennial Dinner and interview prospective students for the College Admissions office. Jackman served on the Visiting Committee to the College, and in 1995, he was elected to the University’s Alumni Board of Governors and served a six-year term. Having chaired the board’s Nominating Committee, he has continued to work on board initiatives as a founding sponsor of the Externship Project, which offers second-year students a chance to “shadow” alumni in various professions. He also has served as a panelist for the Taking the Next Step program for third-year students and interviews applicants for the Metcalf internship program. An active member of the Graduate Order of the C, he served on the committee to select the inaugural class of the University’s Athletics Hall of Fame. Joan Spoerl (A.B.,’85) has volunteered in many capacities on behalf of Chicago’s alumni community. She has helped plan reunions for the College Class of 1985; held summer send-off parties for new and returning College students; and participated in the Volunteer Leadership Caucus to train and celebrate alumni volunteers. A longtime member of the Chicago-area alumni club, Spoerl led a movement to eliminate membership dues, expanding communication about alumni events to all 34,000 alumni in the Chicago area. Elected club president in 2003, she built a more cohesive volunteer board and introduced a series of events aimed at alumni not previously targeted by programming. She also initiated popular family programs on campus and around the city, including a screening and discussion of an acclaimed documentary, Brother Outsider, the Life of Bayard Rustin, which engaged a diverse group of alumni, faculty and students. Her recent relocation to Cleveland has given her the opportunity to work on that city’s first alumni-initiated event. David Terman (LAB,’51, A.B.,’55, S.B.,’56, M.D.,’59) and Mari (de Costa) Terman (LAB,’51, EX,’53, EX,’59) share an extraordinary commitment to the University, shown by their years of volunteer leadership in University activities. The couple met at the Laboratory Schools, and Dr. Terman remained at Chicago for his entire education, from the College through the Pritzker School of Medicine. A psychiatrist and psychoanalyst, he directs the Chicago Institute for Psychoanalysis. Mrs. Terman matriculated at the University, but earned degrees at Radcliffe College and Northwestern University. The couple’s younger son in 1994 became the fourth generation in his family to graduate from the University’s medical school. Dr. Terman was a mainstay of the Medical and Biological Alumni Association, serving as a member of its executive council and then as its president. He served for six years on the University’s Alumni Board of Governors, and he has participated in reunion planning and gift committees for his College class. He currently is on the Visiting Committee to the Social Sciences Division. Mrs. Terman has served the Oriental Institute for many years as a member of its Visiting Committee and a museum docent. She also has worked with Oriental Institute archaeologists who are excavating an ancient site in Tell Atchana, Turkey. The Public Service Citations honor those alumni who have fulfilled the obligations of their education through creative citizenship and exemplary leadership in service that has benefited society and reflected credit on the University. Charles Curie (A.M.,’79) has devoted his professional career to ensuring that people with addictive and mental disorders have the opportunity to participate fully in society, and he has significantly advanced public policy on prevention, treatment and recovery. As Deputy Secretary for Mental Health and Substance Abuse at the Pennsylvania Department of Public Welfare, he empowered consumer and family advocacy groups to reform mental health and substance abuse care. The new partnerships resulted in the elimination of seclusion and restraint procedures from the Pennsylvania system, making the state a model for system reform. Today Curie serves as Administrator of the U.S. Substance Abuse and Mental Health Services Administration of the U.S. Department of Health and Human Services. He has successfully argued for the passage of parity legislation to guarantee equal insurance benefits for individuals with mental illnesses as those with physical illnesses. Curie’s leadership has made a positive difference in the lives of millions of Americans. In his career as a health care administrator and CEO, and international health consultant, Robert DeVries (S.B.,’58, M.B.A.,’61) has contributed to the health care field and advanced health management and policy education internationally. He served for nearly three decades as director of health programming for the W.K. Kellogg Foundation, one of the world’s largest philanthropic organizations. He was a pioneer in the origins of hospice, holistic health care and community benefits standards. DeVries, who retired in 1999, has written more than 50 publications and has been a reviewer for six professional journals. In addition, DeVries serves as an adviser to several hospitals and the Ministry of Health in China, where he helped introduce quality assurance standards to the national health care system. He also has been an adviser on rural health to two U.S. secretaries of Health and Human Services. DeVries chairs the Quality Committee of the board of Battle Creek Health System. He and his wife Eleanor have a long commitment to philanthropic support for the arts and education, including medical and nursing education. The Professional Achievement Citations were established in 1967 to recognize alumni who have brought distinction to themselves, credit to the University and benefit to their communities through their vocational work. Harry Groves (J.D.,’49), a leader in legal education for more than five decades, entered the University’s Law School following service in World War II. After graduation, he received a Ford Foundation fellowship to study at Harvard University, where he became interested in constitutional law and the constitutions of newly formed nations. This passion became a lifelong interest, leading him to a professorship and deanship at the University of Singapore, several lecture tours in Asia, and numerous publications on Asian law, including four books on the constitution of Malaysia. Groves also has published widely on affirmative action and domestic law. He has served as law school dean at Texas Southern University and North Carolina Central University. He also was president of Central State University in Wilberforce, Ohio, and the Brandis professor of law at the University of North Carolina at Chapel Hill, where he now is a professor emeritus. Colleagues credit him with superb leadership in advocating diversity in Southern law schools during and after the civil rights movement. In addition, Groves chaired the Ethics Committee for the United States Olympic Committee in 1993. William Niskanen (A.M.,’55, Ph.D.,’62) is a highly regarded micro-economist and a proponent of the Chicago School of Economics. 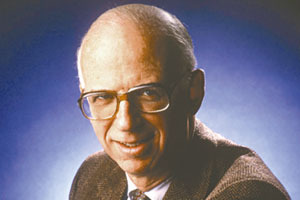 In the course of his career, he has served as acting chair of President Reagan’s Council of Economic Advisors; professor of economics at the University of California, Berkeley, and the University of California, Los Angeles; defense analyst for the Pentagon, the RAND Corporation and the Institute for Defense Analyses; founding editor of the magazine Regulation; and president of the Public Choice Society. Since 1985, Niskanen has been chairman of the Cato Institute, a libertarian public-policy research foundation. Richard Rorty (A.B.,’49, A.M.,’52) is regarded by many as “the greatest living American philosopher.” His 1979 book Philosophy and the Mirror of Nature offered a major critique of the analytic philosophy that long dominated American and British academia and revived the uniquely American tradition of pragmatic philosophy. This book and his subsequent work decisively changed the way people think about philosophy, literary theory, political theory and history, and it shaped the course of the humanities and social sciences in the second half of the 20th century. Rorty also has published regularly in such magazines as The Nation and Dissent. His latest book is Philosophy and Social Hope. Henry Schwarcz (A.B.,’52) is an internationally recognized geologist who has linked geology, archaeology, anthropology, paleontology, climatology, ichthyology and seismology to revolutionize the dating of archaeological artifacts. He pioneered the use of electron spin resonance to determine the age of teeth, which produced the strongest evidence yet discovered that humans lived in the Middle East during the Ice Age—much earlier than previously thought. Additionally, his work with isotopes is helping archaeologists uncover new information on ancient diets. A versatile scientist, Schwarcz has contributed to the study of paleoclimates, stable isotope geochemistry of human and animal bone, and isotopic analysis of food residues on ceramics. He currently is university professor emeritus at McMaster University in Ontario, Canada, where he has taught since the 1960s. At McMaster, he has mentored junior faculty and generations of students, many of whom are now geoarchaeologists. Cliff Tabin (A.B.,’76) has done pioneering work in developmental biology, exploring how a fertilized egg gives rise to an adult animal. His work has significantly improved the understanding of the molecular basis by which form and structure are regulated during vertebrate development. Together with two colleagues, Tabin discovered a family of molecules, called the hedgehog genes, which are responsible for left-right asymmetry, setting up patterns throughout the body, including establishing differences between the left and right sides of the body and organization of the limbs, heart and of parts of the brain. Tabin received his Ph.D. in biological sciences from M.I.T. in 1984, and in 1989 joined the faculty of Harvard Medical School, where he remains and where he won seven teaching awards. His knack for explaining complicated genetic developments has made him a much sought-after keynote speaker at national and international venues. Among his many honors, Tabin received the 1999 Award in Molecular Biology from the National Academy of Sciences. Harold Ticho (S.B.,’42, S.M.,’44, Ph.D.,’49) has been a leader in the creation and development of experimental elementary particle physics. By contributing to the discovery of several resonances that led to the quark elementary particle model, his work has shaped current understanding of the basic composition of matter. He was an important member of the Nobel Prize-winning research team led by Louis Alvarez (S.B.,’32, S.M.,’34, Ph.D.,’36). A two-time Guggenheim fellow, Ticho has recently investigated electron-positron annihilations. Ticho, a professor of physics at the University of California, Los Angeles, for 35 years, is credited with founding and building the institution’s program in high-energy physics. In 1983 he became the vice chancellor for academic affairs at the University of California, San Diego, where he now is professor emeritus. Ticho has served on the Board of Trustees of the Universities Research Association, and he chaired the management committee for the Keck Telescope and the review board of the U.S. Department of Energy’s high-energy physics program.